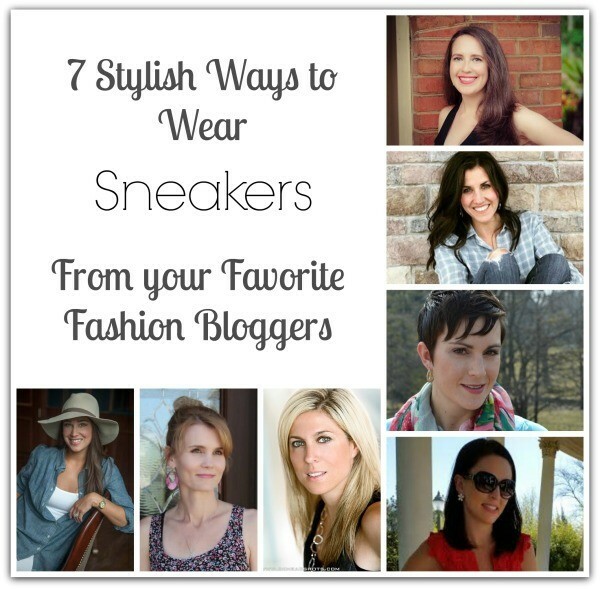 I’m back with more stylish sneaker outfits for you today and sharing 6 other ways to wear them from my fashion blogging friends. (Check out our outfits from last time here.) Sneakers are a huge trend this spring and there are more ways to wear them than with those comfy yoga pants. When it comes to my spring wardrobe, there are two items that get worn a lot. 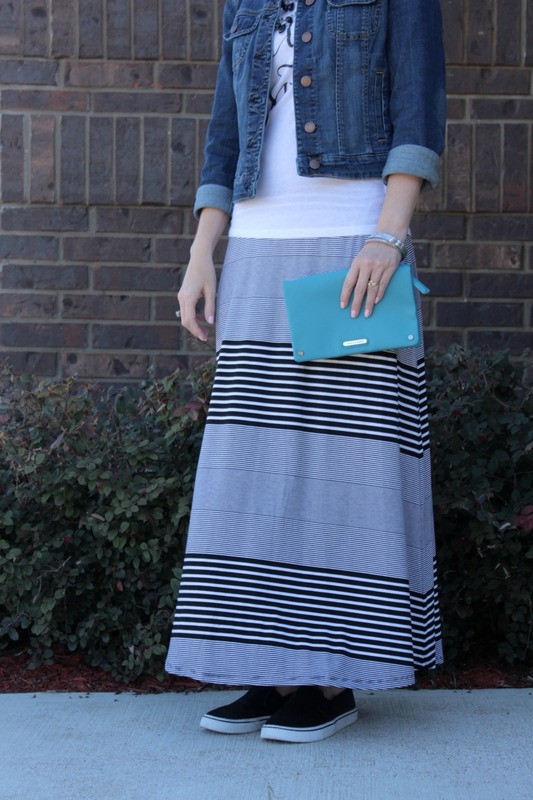 I’m talking about maxi skirts and maxi dresses. I love them! There are so many different ways to style these two pieces and I have a blast coming up with outfits. 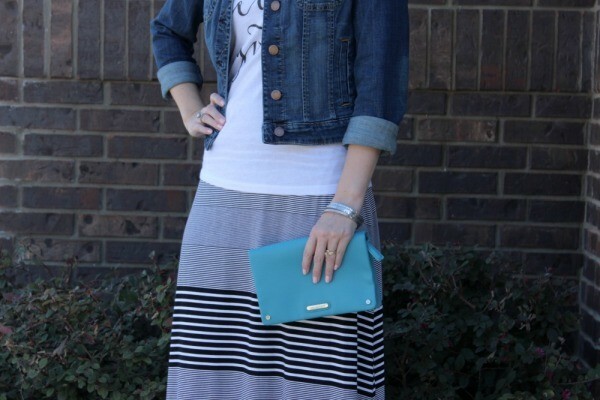 Have you ever worn sneakers with a maxi skirt before? I sure hadn’t! Until these sneakers entered my life, I barely wore any except to work out in. 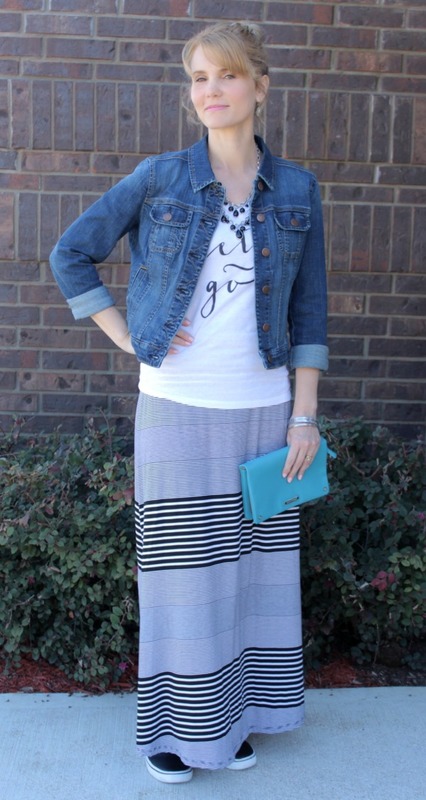 I paired my Carolyn Slips Ons from Target, with a knit maxi skirt (also from Target), my Let It Go Tee from Cents of Style and a denim jacket from Kohl’s. Add in a statement necklace, stacking bracelets and earrings – and I have an outfit perfect for a day out shopping or running errands with the kids. Spring can be tricky when it comes to the temperature, so by layering this outfit with a denim jacket or cardigan, it gives me the option to shed a layer when the sun is beating down. How do you style your sneakers? I hope you enjoyed our sneaker outfits! Stay tuned next month for another fun fashion collaboration with these six stylish ladies! 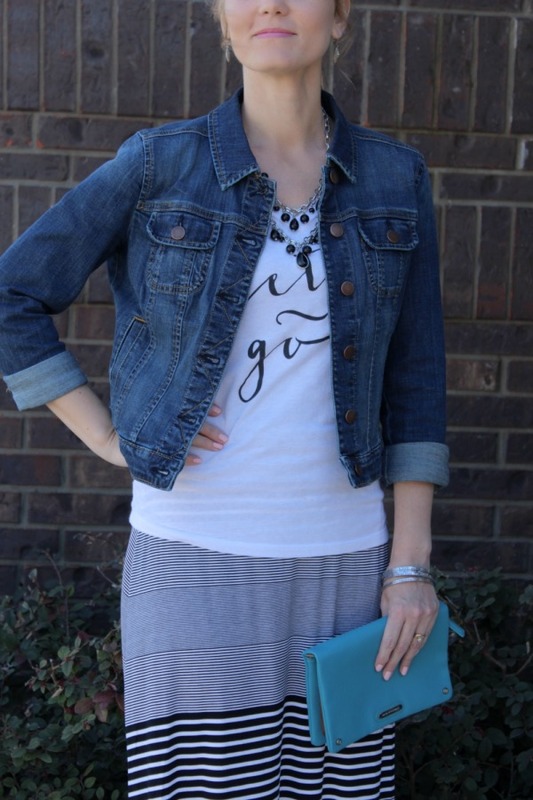 I love this look what a great way to take jeans and a tee up a level and make them stylish! Two of my fave things…sneaks and maxis…Love this look! I loved how you styled your sneakers!!! I so need to invest in a jean jacket!!!! You look amazing!!! 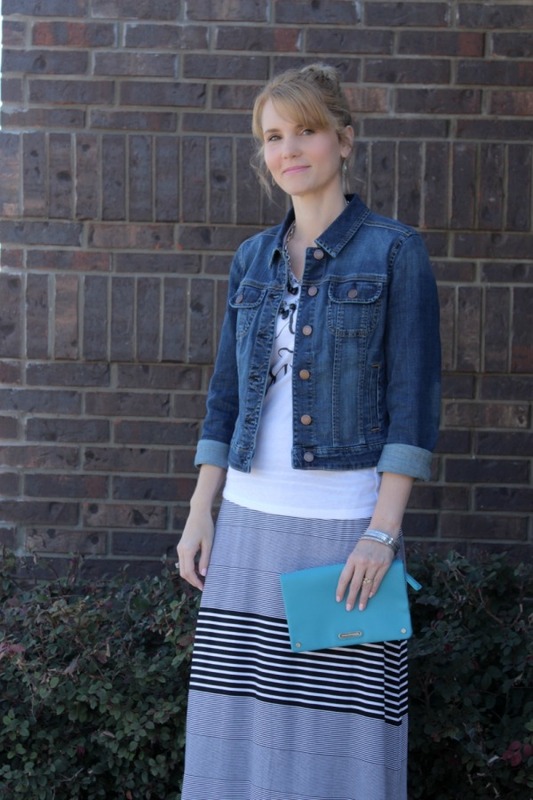 I love how you style your sneaker look with a maxi skirt! I like how we both went feminine with our looks! Beautiful! 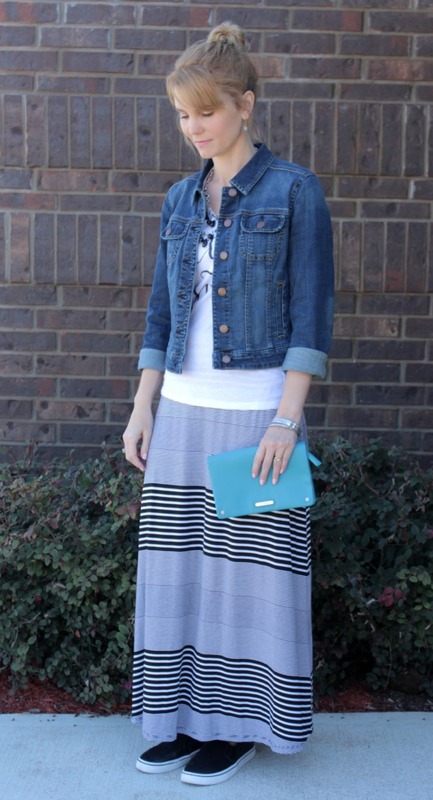 Oh I love the idea of kicks and a maxi..stealing that! i love this, love!! I need to learn to wear sneakers with maxi’s and dresses. I love it. Gorgeous friend. Thank you Andrea! I wasn’t sure if I was going to like the look, but I do! Hey, I really like your outfit. Do you wear your sneakers without socks?